I love craft cocktails because they’re the great American drinking innovation and because they make all my lame jokes seem wicked funny. There’s much fun to be had at this arcade/bar, feeding quarters into vintage video games and pinball machines. 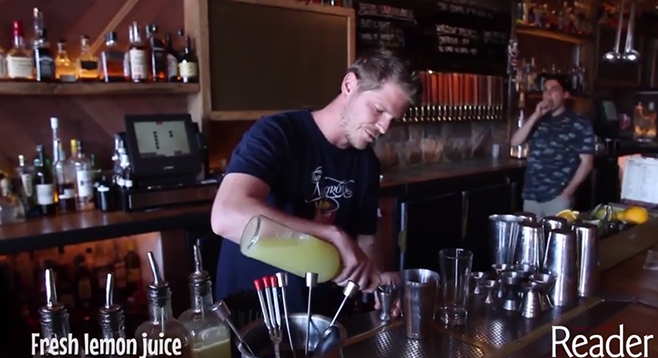 Bartenders whip up stiff drinks for about $8.50. True Blood (mint-infused Pimm’s, raspberry, lime) is a crimson beauty. Kentucky Tippler (grapefruit-infused bourbon, honey, lemon, sarsaparilla bitters) drinks like a stronger Old Fashioned. Downright Fierce (bourbon, vanilla liquor, sugar cane, aromatic bitters) is icy cold, tastes stronger than it smells, and still manages to go down easy. Of the many beer cocktails, Double Barrel (bourbon, spiced rum, cinnamon, orgeat, and brown ale) intrigues most, though a $6 michelada never hurt. Head bar guy Eric Johnson cut his chops at Noble Experiment, but the style at this cedar-scented, dad-themed, retro bar is much more laid back. Craft cocktails run $9 each, $6 during happy hour (M-F 5-7, weekends 4-7). The signature Hardly Wallbanger adds vanilla soda to the classic combo of vodka, Galliano, and OJ. Everything that includes the Dark Horse Roasters coffee syrup is worth a look, and the bartenders do a good job of coming up with thematic specials to suit any occasion. This newcomer focuses on bubbly and a compelling menu to go alongside, but the bar also makes a selection of cocktails sporting sparkles ($13). The Encore champagne cocktail lays a heavy splash of Landy Very Special cognac atop a sugar cube, which gradually mingles with the bubbles from some Piper Sonoma Brut. The bar mixes a mean French 75 (Hendricks, lemon syrup, Piper Sonoma), and the champagne mojito is a less-sweet version of the original, with lemongrass syrup and a float of French bubbles. Bellini and Kir Royale come in a variety of flavors outside the traditional peach and blackcurrant. If such a thing is possible, the bar here designs the $10 cocktails to go well with the (delicious) sausages and indulgent bar food on the menu. Diplomatic Immunity (vodka, blueberry sage, maraschino, lime, and simple syrup on the rocks) may be fruity, but it’s deceptively strong. The sage flavor is impressive, since herbal notes are often lost in such drinks. The White Sour Beer Cocktail is fun: orangey and kind of spicy. The Abe Froman (tequila, Pimm’s, Cynar, lemon, simple syrup, Peychaud’s bitters, cucumber) is a cool idea, largely because we don’t see many bitter tequila cocktails. Hello Betty's Crispy Apple: Apple Cider Strongbow, Licor 43, Apple Pie Moonshine. Kicked-up cocktails for far North County! Million-dollar design with a flair for vintage surf culture and a wide-open vibe give this Oceanside newbie a big advantage in the looks department. The menu is pure mariscos, but the drinks go beyond the local taco shop, which makes for a fun meeting of styles. The bar’s specialty is margaritas, and the O’side Rita is pretty good, but try the Baja Michelada on draft; laced with rum, it’s not your average cerveza preparada. The Betty’s go-to Mai Tai uses tarragon sugar, Bacardi 1909, and lime for a tiki-fabulous libation. Old-school cool reigns supreme at this tartan-clad whiskey bar, where the best drinks are clever riffs on the classics. The $9 draft Old Fashioned (100-proof Old Grand Dad, bitters, sugar) gets the job done; no muss, no fuss. The $11 Whiskey Sour (Seven Grand single-barrel bourbon, sugar, lemon, egg white) has a soft touch, but a strong finish. When all is said and done, the $11 Kentucky Mint Julep is the king. Woodford reserve, crushed mint, and sugar served over a snowcone of crushed ice in a pewter cup is legit, strong, and refreshing. Why wait till the sun sets to indulge? T’s has been satisfying day-drinkers with fancy Bloody Marys since before craft cocktails were a thing. The restaurant closes before most bars even open, and the Bloody Mary here is so successful they sell bottles of mix to go for $15. Quiet, beachy, Solana surroundings make for a change of pace from the moody, serious style typical of contemporary cocktail bars. Swing through here on Mondays and Tuesdays, when the happy hour lasts all night and the craft cocktails are just $7 (otherwise $9.50). Blue Ribbon embraces fruit flavors with their drinks, without spilling over into actual fruitiness. The notable black Margarita boasts undeniable blackberry overtones, but is still very much a ’Rita. The Blood-Orange Moonshine Cocktail retains the deep color of the eponymous fruit, and a sweet, boozy taste with a hint of sharpness and neutral spirit flavor from the commercial hooch. The bar’s clever take on the Manhattan substitutes Nonino (an Italian amaro) for the vermouth.